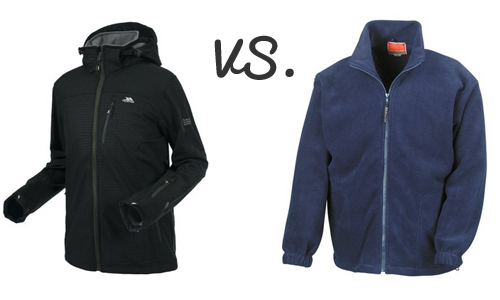 So, you should choose a softshell jacket or a fleece one? If the time has come for you to purchase a new jacket and you have decided that you want it to be lightweight, not too heavy and not too thick, this question has probably come to your mind. There are thousands of colors and designs available in stores, either locally or online, but the problem is, you are not sure which one of these two types of jackets is best suited for you. In this article, we have researched both types and have compiled a sort of tutorial to help you in making the right choice. We’ll break down each of the jackets’ specifics and features, comparing them to each other, in order to see which is best when it comes to weather-resistance, durability, breathability, etc. Most people, at some point in their life, have owned or at least worn a fleece jacket. 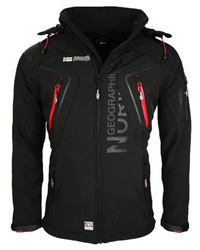 They are typically long sleeved jackets, with a hood, side pockets and that close up with a zipper. The material they are made of is usually polyester, which is a hydrophobic fiber. What that means, is that when it comes in contact with water, it tends to repel it, instead of absorbing it. There are however more natural options, such as merino wool fleece. Fleece jackets are very lightweight jackets, and they are comfortable to wear and soft to the touch. They dry quickly, are quite warm and are highly breathable as well. Softshell jackets are by far the most popular outdoor jackets and especially when it comes to sports. They are made of polyester and nylon, are highly breathable, very durable, provide quite good insulation and warmth, and are really lightweight. 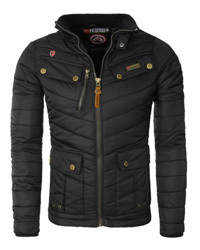 Their main popularity lies in their design, these jackets are made for movement. They are form-adjusting, stretchable and allow for maximum mobility. Usually coming with a hood and insulating cuffs, hem and collar, these are ideal to be worn as layering jackets, but can definitely be worn on their own. Now that we have made a short introduction of each of the jackets, it’s time to compare the two, feature by feature. Along with this article we have also created an infographic that compares the main features of these two types of jackets. Feel free to share it on social medias and on your website. When it comes to jackets, warmth is the main, if not the sole reason, for wearing them. The good thing of a fleece or soft shell jacket, is that they are not as heavy as typical winter jackets, and are much more versatile when it comes to wearing them. There isn’t much difference between the two, when it comes to warmth and insulation, and this is because, despite soft shells being made of an outer lining, the inner one is almost always made of fleece. The purpose of a fleece jacket is providing warmth and then being able to retain that warmth, by being highly insulated. Soft shells, though, have a design feature for added insulation, which are knitted or Velcro cuffs, the purpose of which is to minimize the areas that wind can get inside the jacket. We mentioned fleece being water repellent, however, this does not mean that it keeps the water out, it just doesn’t absorb it. In a less confusing description, water goes through the fabric, instead of being absorbed by it, which is the case with cotton, for example. And when water goes through a fleece jacket, the only direction is inwards, which means that the person wearing the jacket, will get damp. However, fleece jackets are fast-drying, but this is not useful when you are stuck in pouring rain. Soft shells, on the other hand, do offer weather protection, to an extent. They tend to be water resistant and windproof, aided by the insulation, but they are not completely waterproof, which must be kept in mind, when spending time in wet conditions. So if you are looking for a warm jacket and it’s dry outside, then fleece jackets are quite suitable and for damp weather, a soft shell is the best choice. But if it’s raining hard, or even snowing, then these jackets are best used as layering, underneath a heavier, waterproof jacket. Breathability in a jacket is a very important feature. The purpose of a breathable jacket is to allow for perspiration to leave the body, in order to keep you dry. When it comes to comparing fleece and soft shells, despite both being highly breathable, many soft shells are specifically designed to offer maximum breathability, since the main purpose of a soft shell jacket is to be worn during physical activity. Therefore it is very important that perspiration leaves the body, thus avoiding overheating and dampness. Another feature of some soft shell jackets is their ventilation zipper, usually located underneath the arms, which is essential when it comes to more dynamic activities such as mountain climbing. Mostly made of polyester, fleece is very durable. It can last for a long time and fares quite well to being worn often. However, something that might put people off about these jackets is their tendency to pill over time, with washing. 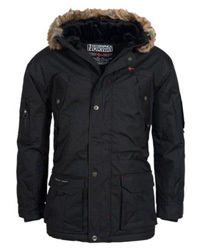 This does not only affect the look of it, it also lessens the insulating ability of the jacket. Another issue with these jackets, is the fact that they generate static, which then attracts pet hair, dust and lint, requiring often brushing and maintenance. As mentioned in this article from the experts at Backcountry.com, fleece tends to be resistant to soap, along with being resistant to water, which then creates the ideal environment for microorganisms to flourish, giving off an unpleasant smell, which is another issue to consider when purchasing a fleece jacket. Soft shells, on the other hand, are made of nylon and polyester, and are also quite durable. However, they do not pill, and definitely do not mind being worn daily. They wash and clean nicely, and also come reinforced with inner patches, usually on the shoulders and elbows, in order to prevent tearing or damage to the fabric. This is a point where both jackets meet and neither lacks in this regard. There are many options for both types, when it comes to colors and patterns. 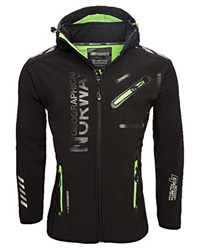 There are designs that make the jacket look more suitable for sports, but there are also designs suitable to be worn in different occasions, not sport-related. As always, the look and style of clothes is a very personal matter, we just wanted to mention that there are many choices available for each. When to wear each of these jackets? This is something you might be wondering by now, after having gotten through all the technical features. Fleece jackets are traditionally worn as layering jackets, for added warmth, insulation and breathability, underneath a heavier winter jacket. This stands true for softshells as well. You can wear a fleece jacket on its own, given that the weather is dry and not too cold, and on a daily basis. However, fleece jackets are not very suitable to be worn during very dynamic sports, because they lack the necessary design, that allows the wearer to move freely and without hindrance. This is where soft shells truly shine. They are specifically designed for stretching and adjustment, as mentioned above, and can be worn in any sport you prefer. Judging by the weather conditions, soft shells can be worn on their own or as layering jackets, just like the fleece ones. They can be worn during hiking, running, walking and even skiing. Most soft shells come with reflective logos, that are necessary when out in the dark. As a conclusion, you can make the choice you prefer, taking into consideration your level of activity, the weather you live in and the purpose you are purchasing a lightweight jacket. Soft shells fare better and are much more versatile, however, fleece jackets are very comfortable and quite soft, which to some, might be an important quality when it comes to jackets.